As demand for connectivity and mobile communications continues to grow, network operators are increasing their footprint to reach new customers, open up new markets, and increase their revenue stream. Managing networks has become increasingly complex; reducing operational expenses and increasing productivity become key strategies in maximizing shareholder value. SkyLIGHT Director™ is a centralized management platform for Accedian network performance elements and modules. It provides FCAPS functionality for Accedian performance elements and modules including the CE, FS, FS 10G, LT, GE, GT, GX, FSX, NE, AT, Classic Actuator/VCX, Nano, and Ant. Multiple concurrent users can view and manage these Accedian devices, greatly simplifying the tasks of network operators. From initial installation through unit lifecycle administration and maintenance, SkyLIGHT Director simplifies, secures and accelerates Ethernet service validation, fault management, and performance. SkyLIGHT Director combines proven open source platforms with a browser-based user interface to provide a powerful performance management tool. Built around a robust task automation engine, it can perform network-wide operations for device backups, device commissioning, firmware upgrades and even run multiple concurrent service validation tests. By extending the Accedian instant provisioning system, SkyLIGHT Director reduces operational effort to an absolute minimum. New units go from the box to being managed in just minutes. The SkyLIGHT Director Vision Module provides centralized fault management for a rapid view of network health. An alarm banner is always visible, providing a quick tally of all active alarms, as well as any loss of connectivity to the underlying elements. Operators can drill down in the active alarms event list, which displays the most recent events in the system. This list provides alarm conditions, source entities and probable cause details. SkyLIGHT Director™ provides real-time events by listening for activity from the underlying network. The alarm list is periodically refreshed on each device to maintain accurate alarm counts and to ensure operators are provided with an exact view of active alarms. 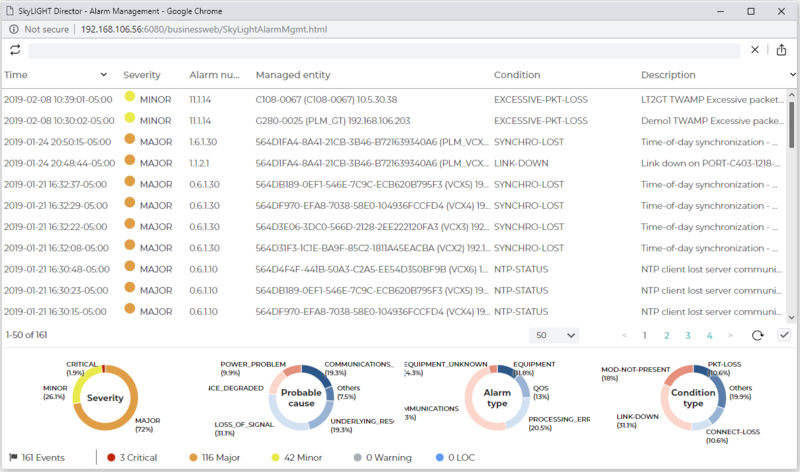 Sorting and filtering active alarms is possible through an active alarms query tool. The multiple query options available can be combined to provide a view based on specific network elements, severity or time range. The SkyLIGHT Director Vision Module automates network-wide configuration management through its inventory collections, unit backup archiving and export functions and firmware management capabilities. Its task automation engine can process thousands of Accedian devices at the same time. Configuration files can be stored on either the server or on an external server, depending on your specific requirements. SkyLIGHT Director offers Vision Flow as an optional, value-added application. Vision Flow provides network operators with template-based commissioning tools to standardize and streamline the device turn-up process. Leveraging the flow engine, commissioning operations can be either launched automatically upon device installation or scheduled for a single device or multiple devices concurrently. As part of the SkyLIGHT performance assurance platform, the SkyLIGHT Director Manager Module provides a comprehensive solution for creating TWAMP and Ethernet DMM sessions verifying network service level agreement (SLA) compliance on a granular and continuous basis. The SkyLIGHT performance assurance platform enables one-way monitoring of network performance with high accuracy without the need for external synchronization. Data is the great equalizer. Providing service providers with insightful data about the performance of their network is paramount to ensuring that SLAs are being met and that the required quality of service is being delivered to end customers. SkyLIGHT Director™ offers Vision Collect as an optional value-added application to obtain this data. Vision Collect is a performance data collection and distribution engine that provides near-real-time statistics, down to one-second granularity. In order to optimize network bandwidth while minimizing CPU and data-caching requirements, a permanent data stream is established between the devices and the SkyLIGHT Director™ platform. SkyLIGHT Director™ offers Vision Service Performance as an optional value-added application. Vision SP is an ITU-T Y.1564 and RFC-2544 coordinator that enables centralized configuration and control of service validation tests. From one central screen, network operators can configure tests that include loopbacks for two-way flows and reverse tests for one-way flows. Once tests are configured, SkyLIGHT Director™ is used to launch them from a central location. Test progress can then be monitored and test results retrieved in real time as the test runs.